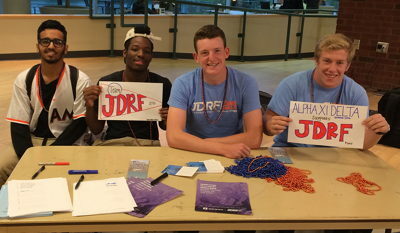 Delta Tau Delta established its national philanthropic partnership with JDRF in 2012. This partnership engages the Fraternity’s more than 130 chapters and colonies on college campuses nationwide to work closely with local JDRF chapters to help raise funds and awareness of type 1 diabetes (T1D). Since the partnership began, Delta Tau Delta chapters have raised more than $1.6 million for T1D research. Additionally, Delta Tau Delta undergraduates and alumni have contributed countless hours of service through local JDRF chapter events. The partnership between Delta Tau Delta and JDRF strives to create multiple avenues for philanthropy and creativity, from volunteering at JDRF galas and forming walk teams to creating campus fundraising and awareness events to benefit T1D research. Type 1 diabetes (T1D) is an autoimmune disease in which a person’s pancreas stops producing insulin, a hormone people need to get energy from food. T1D strikes both children and adults, and its onset has nothing to do with diet or lifestyle. There is currently nothing you can do to prevent it, and there is no cure. Reach out to your local chapter visit https://www.jdrf.org/jdrf.org to find a chapter near you) to find out about volunteer opportunities. Whether one brother wants to come into the JDRF office, 10 brothers want to help out with a JDRF Gala or the entire Chapter wants to help the JDRF One Walk run smoothly, JDRF has an opportunity for you. JDRF One Walk Team: The One Walk is JDRF’s flagship fundraising event and the largest type 1 diabetes (T1D) event in the world. Join thousands of people as they raise funds to create a world without T1D. To learn more, find a walk near you or to register your team, please visit walk.jdrf.org. Fundraiser using Team JDRF: Team JDRF is a way that anyone and everyone can partake in the fight against T1D through grassroots fundraising. Create your own custom event, with online registration and fundraising capabilities. To learn more, visit team.jdrf.org or connect with your local JDRF chapter. 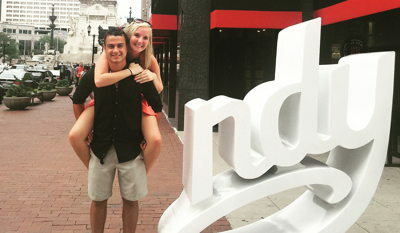 Any event to support JDRF: Delt Chapters across the country have come up with many creative ways to support T1D research. Reach out to your local JDRF chapter to start planning an event today. To learn more about how your chapter can support JDRF, contact Director of Fraternity Programs Andy Longo at 317-284-0203. The SDP provides $150 Million in Federal funding each year to support type 1 diabetes (T1D) research. A large focus of Children’s Congress is on encouraging legislators to renew funding of the SDP. The current SDP funding expires on September 30, 2019. This money is crucial to moving T1D research forward. Delta Tau Delta is a valued partner of JDRF having raised more than $1.6M since 2012. In recognition of the impact, Delt has had on making life better for people living with T1D, the Fraternity will be honored as a sponsor at the 2019 Children’s Congress. 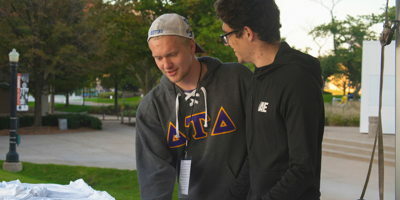 In addition, JDRF invites two Delt undergraduates to attend the event. Representatives from Delt will gain a better understanding of JDRF, T1D and how advocacy works on Capitol Hill. If you have a connection to T1D, JDRF and/or the desire to learn more about government relations and public policy you are encouraged to apply. Representatives will attend events, learn, network, interact with children living with T1D and help Delta Tau Delta advocate for JDRF. Use the form to the right to apply. The application period closes on May 15. Final delegate selections will be made by June 1. Delegates are responsible for transportation to and from Washington DC, as well as all meals and incidentals not included in the event. JDRF will cover 2 nights hotel stay (shared room), along with Monday dinner, Tuesday breakfast and lunch, and Wednesday breakfast. Have you been involved with JDRF in the past? (Either throughout chapter events or personal/family participation). If so, in what way have you been involved? Tell us why you want to represent the Fraternity at JDRF’s Children’s Congress. What would you hope to learn as a Congress delegate? Have you been involved in any advocacy efforts before? If so, please explain. 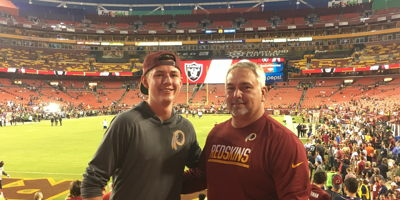 When your dad is a huge Washington Redskins fan, and you want to surprise him, why not tweet Washington Redskins’ linebacker, Mason Foster and ask for game tickets? Chapter President Cade Baker (Grand Valley State University, 2019) is one of two members of Iota Upsilon Chapter at Grand Valley State University with type 1 diabetes. Two worlds came together when Ned Gustafson joined the JDRF International staff in Minneapolis last July. Gustafson was familiar with JDRF, the leading global organization funding type 1 diabetes (T1D) research, even before Delta Tau Delta established its partnership with JDRF in 2012. 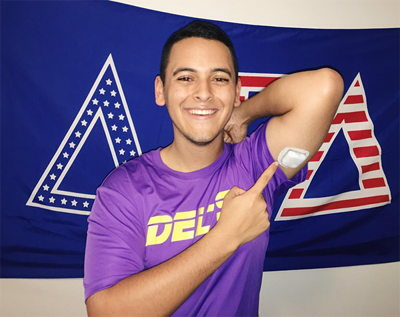 When Juan Carlos Castillo (University of South Florida, 2018) joined Delta Tau Delta and learned about the Fraternity’s philanthropic partnership with JDRF Castillo knew he was in the right place. People like dogs. 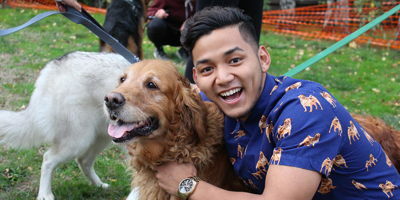 That’s what members of the Gamma Rho Chapter at the University of Oregon determined when they decided to hold a dog-themed fundraiser in support of JDRF during National Diabetes Awareness Month last November. 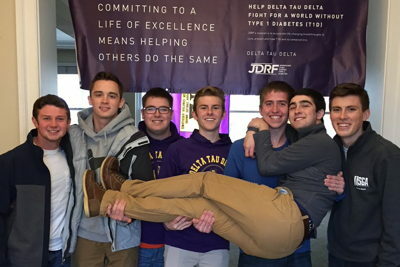 Last fall the brothers of Theta Xi Chapter at Eastern Michigan University decided that hosting fundraisers and donating money to JDRF, the leading global organization funding type 1 diabetes research, wasn’t enough.